My life, like many people I know, is incredibly busy! My goal is to find ways to turn the busy-ness into adventures! I have my two children most of the time during the week, and every other weekend. When they are with their Dad, I know they are out and about a lot. They go out to eat, go shopping, and go to MN to visit family. 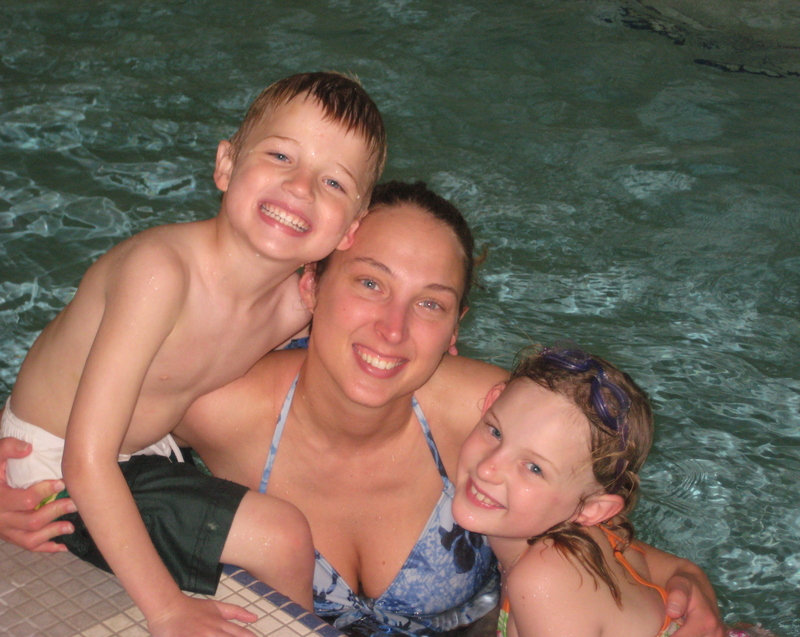 Because of this, on my time with them, I try to let them have more time at home. That way, they can play with their friends, their toys, and just relax. With Grace in Company Dance this year, she dances for over 2 hours on Thursday nights, so Michael and I have some time together. It’s nice to have one on one time with the little guy. I usually see the best side of him during these times, and end up feeling like a proud Mama at how much he’s growing up! As a family though, we do take time to do fun things, such as visit the apple orchards, go to the state fair, go to the park or the zoo, etc. To me, it’s all about finding the balance between fun and down time. The limited time we have together makes finding the balance difficult at times. Unfortunately, sometimes we all feel the strain, and get a little moody towards each other. Even in those moments, we still love each other! When I don’t have my kids, I try to fit in as much as possible. Besides errands, I try to take time for myself (which usually includes wasting lots of time “socializing” on the computer). I also have dance class on Wednesday nights (Hip Hop), and I am dating someone who lives 2 hours away. Having that far of a commute to see each other puts a strain on energy, gas tanks, and available time in general. The great thing, is we make the most of our time together, often with weekend getaways! The downside, is that it also eats up some of the time I would otherwise have for my other friends. I’m not complaining, but I do feel bad that I don’t have more time for them too. I just can’t possibly squeeze in everything I want to do (or other people want me to do)! Jason and I have our kids on a set schedule. Sometimes they line up, sometimes, they don’t. We also have specific events (such as birthdays, SQL Saturdays, weddings,etc) that we try to schedule around. We sometimes get our kids together, sometimes try to have adult-only weekends. It’s tricky, and we often end up scheduling things months in advance! In our 9 months of dating, Jason and I have gone to Chicago, Nashville, Lake Vermillion (twice, once with our kids, once with just adults), and Iowa City. We have also spent weekends playing Rock Band, gardening, doing house projects, and just hanging out. Most of our out-of-town weekends are for SQL Saturdays. For those of you that are non-Geeks, SQL Saturdays are one day events, with training that SQL Users can attend for free. They are held around the country, and are often followed up by an after-party. It actually reminds me of when I was in Partylite, and we would attend Regional Trainings. We didn’t have after-parties though… actually, we sometimes created our own, but that was different! Anyway, when we go to SQL Saturdays, we don’t always have a lot of free time. We usually try to squeeze as much in as we can and meet lots of new people. The weekends end up being a flurry of activity, we are wiped out at the end, but we always agree it was worth it! When we went to Chicago, we decided to stay one extra day. We drove down Friday, Jason (twitter|blog) spoke at the event on Saturday, then we had dinner, and sang karoake at the after party. I had done a little research on things to do in Chicago, so Sunday, we headed downtown to Millennium Park. 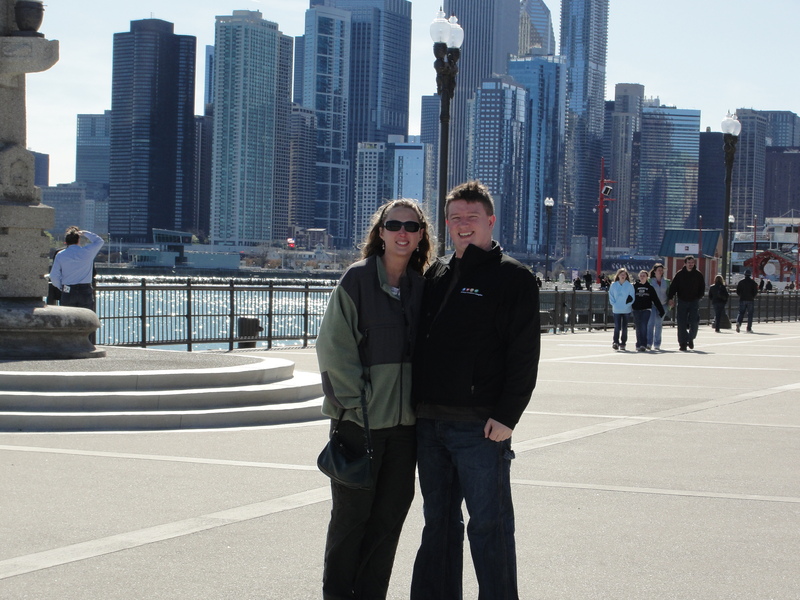 We saw the Bean, walked through the gardens, checked out the sculptures, and then walked to Navy Pier. It was mostly a day of exploration. By 3 pm, we were wiped, but I had gotten us tickets to see the Blue Man Group that night. As we got to the theater, we were starving, and had time to spare. Across the street, was Clark Street Dogs. We had been determined to find some “Chicago hot dogs”, and since we were unable to find any on Navy Pier, we decided to check it out… it ended up being the highlight of the trip (ok, maybe not the highlight, but the best meal, for sure)! We both were drooling over the cheese steaks, and were SO glad we ordered them.. oh, and cheese fries! YUMMY! The Blue Man Group show was a very cool experience. Though we were going non-stop ALL day, I wouldn’t change how we spent it! 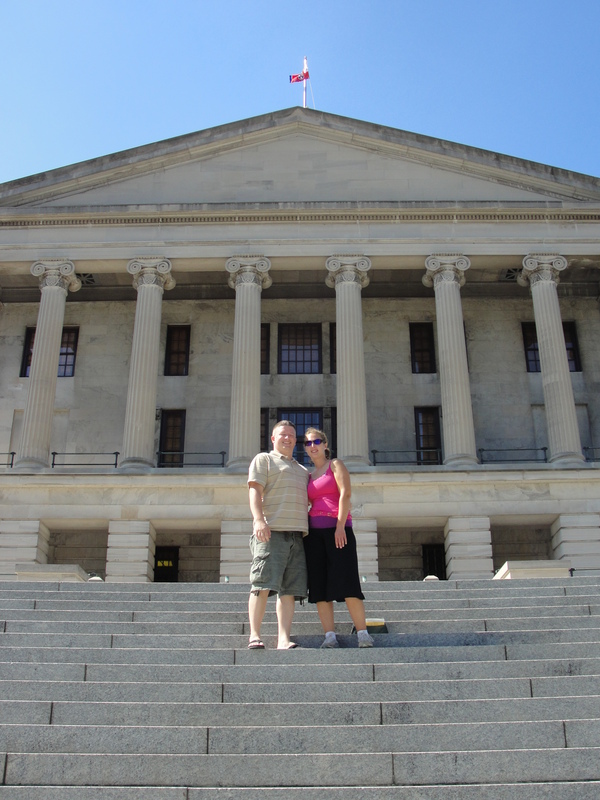 In Nashville, we flew in early Friday, and spent the day exploring downtown Nashville. We saw the Parthenon (and took some really fun “perspective” pictures), toured the Ryman Auditorium and the old Capitol. The next day, Jason was speaking. I had planned on doing some more touring of downtown Nashville, but instead decided to just chill out… I wrote a blog, painted my toes, took 1 1/2 naps… I had finally gotten up the motivation to go explore just as it started raining. It was an awesome, uber-relaxing day sitting by myself in the hotel! That night, we after-partied and hung out with some VERY fun people downtown NashVegas! I finally got to dance on the bar at Coyote Ugly, but that’s another story! Sunday, Christina Leo (twitter), an awesome SQL person we had met in Chicago, took us out on her new boat. We spent the day in 90 degree water, hanging out, having cocktails, jet skiing… it was a GREAT trip! Iowa City was one I was less excited about until I found out how many people that I had previously met would be there… Since it was Iowa, we didn’t plan to stay any extra time. What could possibly be fun about Iowa, right?? Wrong! Besides hanging with some very fun people, we discovered a beautiful college campus, and some beautiful scenery. The fall colors may have helped, but it was a neat little town! 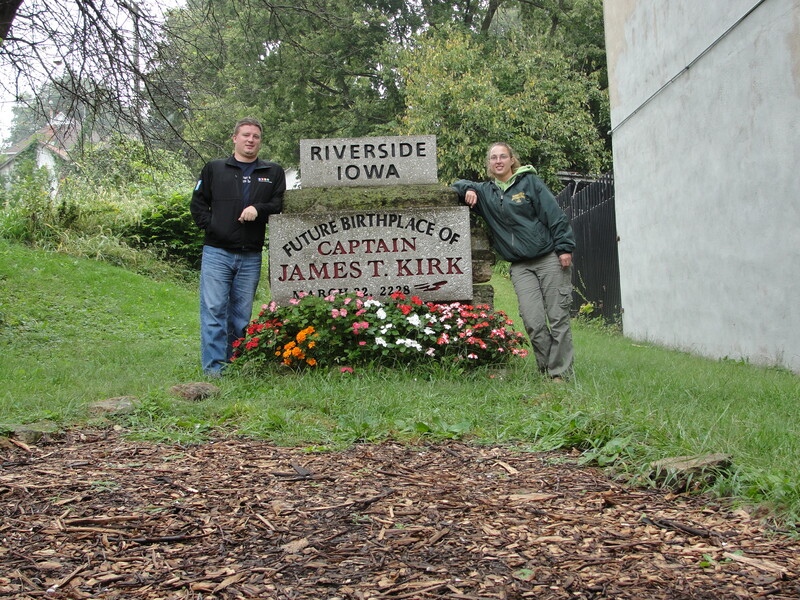 We also discovered there was a small Star Trek museum about 15 miles south of Iowa City, and a monument to the future birthplace of Captain Kirk (though it really looked like a tombstone). We hit the museum (if you want to call it that) on Sunday, on the “way home”. Before we headed down there, we went to the Iowa River Power Restaurant. We had been here for the speaker dinner Friday night, and ended up back here for brunch Sunday. The food was excellent, as was the view. The restaurant overlooked the dam. After stuffing ourselves, we walked along the dam. We discovered that there used to be a coral reef in Iowa… I had to look for some fossil rocks, and found some! So, we didn’t do quite as much exploring of Iowa City, but still found some cool things to see. Whether you have a whole week of time to plan, or a day, you can find fun and/or interesting things no matter where you are. Jason and I are discovering that, one weekend at a time. I hope to pass on my love of exploration to my kids.